It was the proudest moment for all the people who work in the robotics arena as ‘Athena’, a humanoid airport boarded a fight for Germany at the Los Angeles International airport on December 15, 2014. ‘Athena’ is created by German roboticists, and it is now the first humanoid robot to have paid for a seat on a passenger plane. ‘Athena’ resembled much like a human in its design. It has a head, hands and legs, and was seen wearing stylish red sneakers during the time of boarding. The robot is 6 feet 2 inches tall, and it weighs more than 100 pounds. Sarcos, a Salt Lake City-based company has manufactured ‘Athena’, and it is being programmed from Schaal’s Computational Learning and Motor Control Lab at USC. ‘Athena’ is developed using the funds from the Defense Advanced Research Projects Agency, a research program with a military backdrop. The robot is being made as a disaster relief equipment and experts will be teaching ‘Athena’ to carry out dangerous operations which cannot be completed by humans. From Germany, the robot will learn to walk and sit as per the instructions given. In all probabilities, this teaching curve will take more than one year to get completed. ‘Athena’ traveled in Economy class during the journey, but still V I P treatment was given to this special passenger. The robot was accompanied by two researchers Alexander Herzog and Jeannette Bohg of ‘Max-Planck Institute for Intelligence Systems’. Fancy became reality on Wednesday. Though launched ten years ago, The European Space Agency’s Philae lander has sent back first ever images from the surface of the comet 67P. The landing was not a smooth landing, but still it adds a feather to the European Space Agency as this is the first time a traveller landed on the comet without getting crashed. Philae is now stable enough to send back data to the scientists. It has travelled almost 6 billion kilometres to land on the comet 67P. There was probability of Philae getting bounced as there is very less gravity in the comet 67P. But scientists managed to anchor harpoons on the comet to fix the spacecraft on to the surface of the comet. Basically Philae is a robotic probe of a fridge size. Rosetta spacecraft is its mother ship. After seven hours of anxious waiting, Philae got separated from the mother spacecraft Rosette and landed on 67P, the comet that orbits around the Sun more than 510 million miles away towards the direction of the Sagittarius constellation. 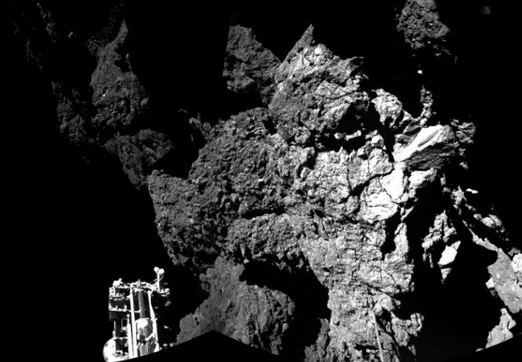 Dr Daniel Brown, an astronomer from Nottingham Trent University said, “Philae has been on the comet for just one day, but the sense of tension and awe it has created has been remarkable. “It is a huge relief to hear that Philae is still functioning and gathering data and images. The amount of emotion we have seen from the team since the landing shows that science does not come from the head alone, but from the heart and soul too. “Space and planetary exploration is touching the very core of what we are about, challenging the impossible and shedding light on the unknown. There was also a possibility that the charge of Philae will get drained as it had only 50 hrs of charge. If the charge would have finished, then Philae would have gone to hibernation. This mission was accomplished with a consortium of partners including NASA. The entire world is now waiting to see what results Philae brings from 67P.